At the Maturity Institute we practice what we preach, which means we always seek improvements and enhancements to our methods and professional practice. This is particularly true of OMINDEX, our global standard for Total Stakeholder Value (TSV). TSV is measured from a combination of a company’s OMR (Organizational Maturity Rating) and its market to book value (e.g. price to book ratio). 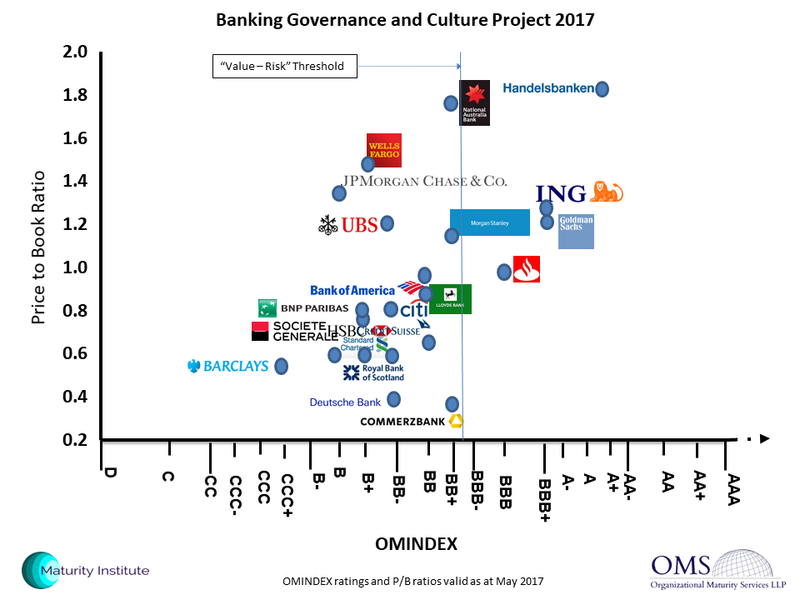 The OMR is produced from our core, analytical and diagnostic instrument – the OM30 question set – which has already been used to rate many FTSE100 companies and produce insightful, sector reports on Banking Governance & Culture and the practices of the Big 4 Accountants. Having learned a huge amount from this evidence, since OMINDEX was launched in 2015, we have now completed our first revision to produce OM30 version 2.0. One major development that also prompted this update is the increase in direct engagement we are experiencing from CEOs. So the wording of the questions (and the accompanying ‘Maturity Analyst Guidance Notes’) have been refined to help senior executives answer the questions simply and explicitly, with specific evidence. One remarkable omission we have witnessed, among the majority of company websites and annual reports we have analysed, is a clear and unequivocal statement of how the company defines its value to society. So we now include a specific question – Question 2. ‘Does the organization define value and is it reconciled with MI’s definition?’ MI’s universally applicable, definition of value is ‘the best possible product or service at the best possible cost, factoring in any undue, negative external impact‘. We have also simplified the ‘AAA’ scale to make it fully compatible with the new Environmental Rating Agency scheme. 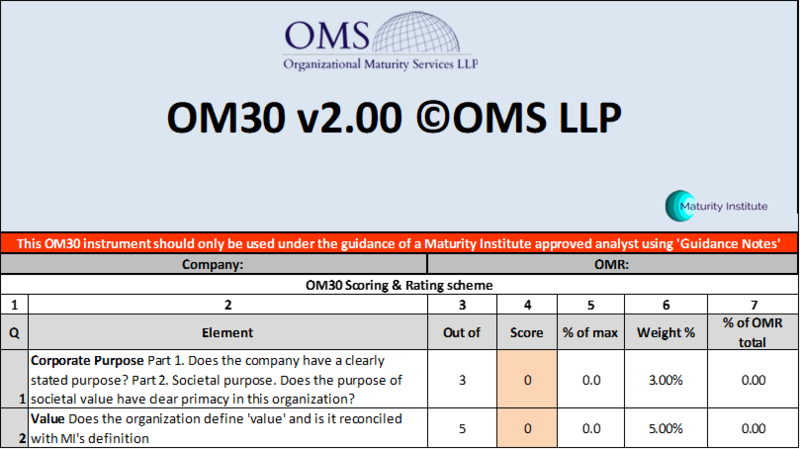 The OM30 is designed as a holistic assessment of an organization’s performance but we attach added weight (allocating 8% of the total OM30 scores available) to the combination of ‘Question 1: Corporate Purpose’ and ‘Question 2: Value’. The people who work in any organization need to be absloutely clear in their own minds where they stand on these top level questions. MI encourages learning by making OM30 freely available and on an ‘open source’ basis. If you would like to start learning how to answer the latest OM30 questions about your own organization, we will be happy to send you a copy of the OM30 v2.0 spreadsheet and ‘Guidance Notes‘. Please contact Stuart Woollard at OMS LLP. This entry was posted in Maturity Tales and tagged OMINDEX, TSV. Bookmark the permalink.